Our final stop in Uzbekistan is the “fabled” Fergana Valley as Jim keeps calling it. Fabled for its “heavenly” horses, and possibly for nefarious drugs. Anyway it’s here that most of the silk in this country is produced, and as this is a Silk Road story, it’s somewhere I really wanted to visit. 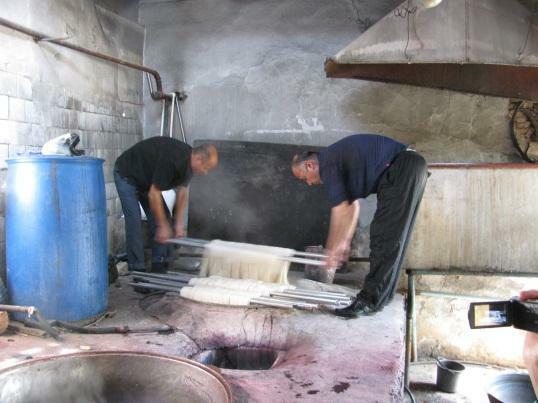 We’ve come to the town of Margilon where there are two enormous silk producing factories (apparently the biggest in Central Asia). 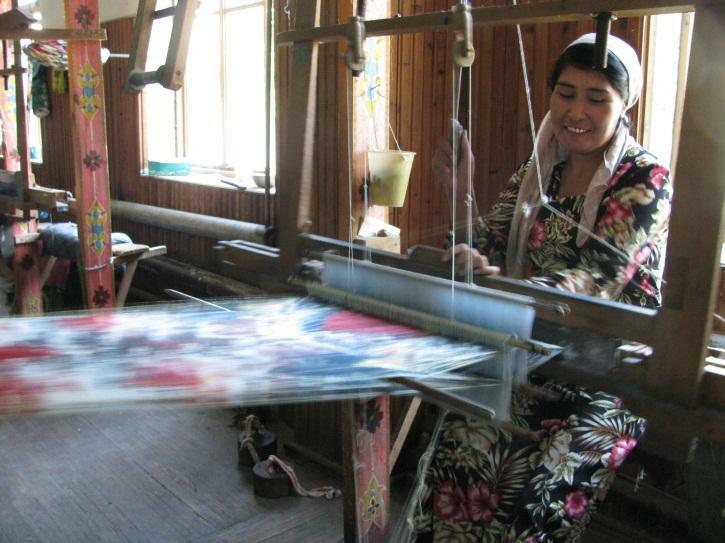 There is also one place which makes silk ikat in the old way – the way they used to make it before electricity and big machines. We have heard good things about the “wonderful tour” they give at the Yodgorlik “Souvenir Silk factory” so I am really looking forward to it and set out with a merry heart, two fully charged cameras at the ready. 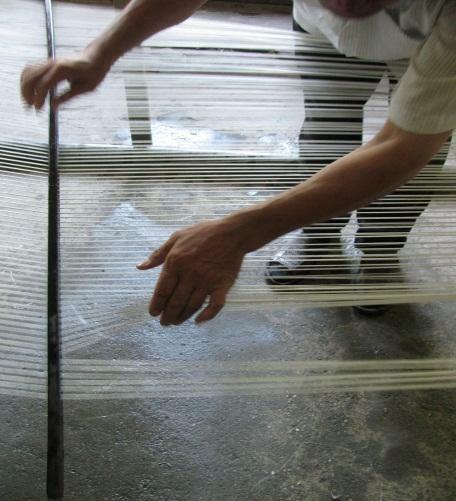 But there will now follow a short lesson in warp ikat and how it is made accompanied by informative photos. Skip this if you already know or couldn’t care less. As you can imagine we were in seventh heaven here and would have been happy to sit and watch for ages, but Old Grumpy guts was having none of it. He was sighing deeply and tapping his watch, so unfortunately we had to be delivered back to the cramped little shop. 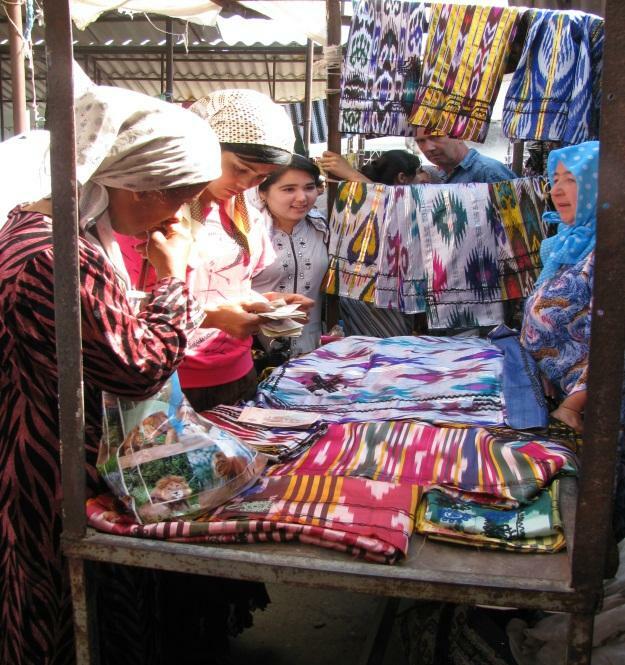 Here we did our consumerist duties and bought a lovely piece of warp ikat “adras” (silk warp, cotton weft) with a design of great big tulips on it. Things are obviously not going too well for Yodgirlik at the moment. We counted a total of about 20 people working. 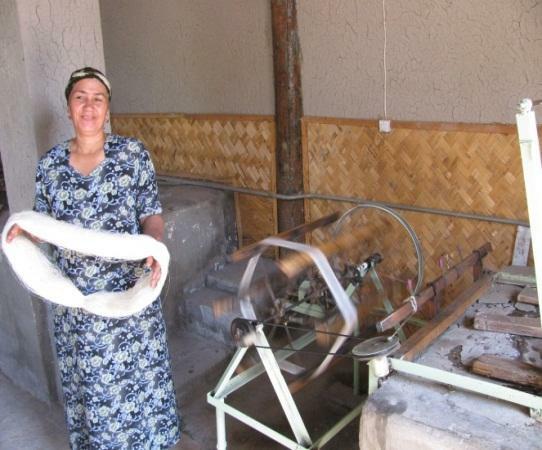 There is only one woman working in the silk spinning room with one hot water vat out of five in use. 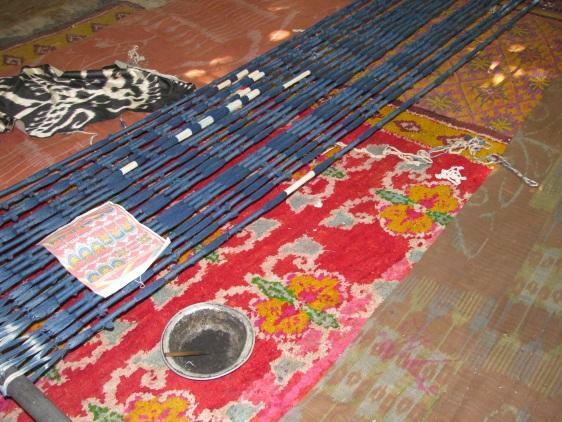 In the ikat tying room, only one set of yarns was being tied. 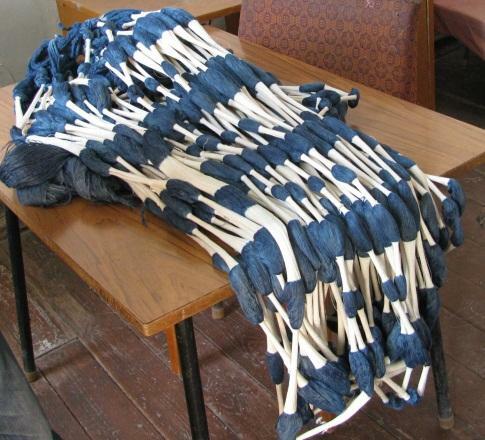 There were a couple of guys in the dyeing room and a couple measuring out a warp and in the big weaving room, only five looms had a warp on them. Let me say now that the idea behind this whole enterprise is wonderful. 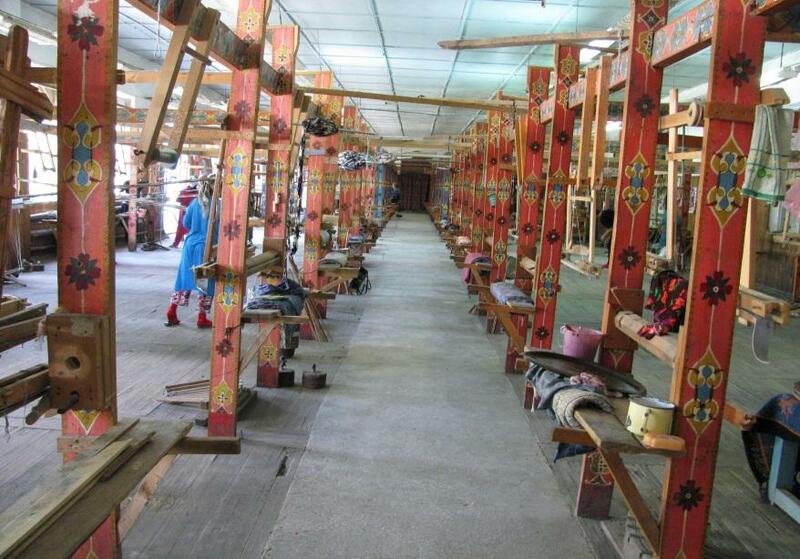 Its aims are thoroughly worthy: to revive traditional warp ikat textiles, to give employment in skilled handicrafts to weavers and dyers, to use natural dyes where possible and to produce top quality textiles. It was started in 1983 with high hopes – but enterprises like this need support. 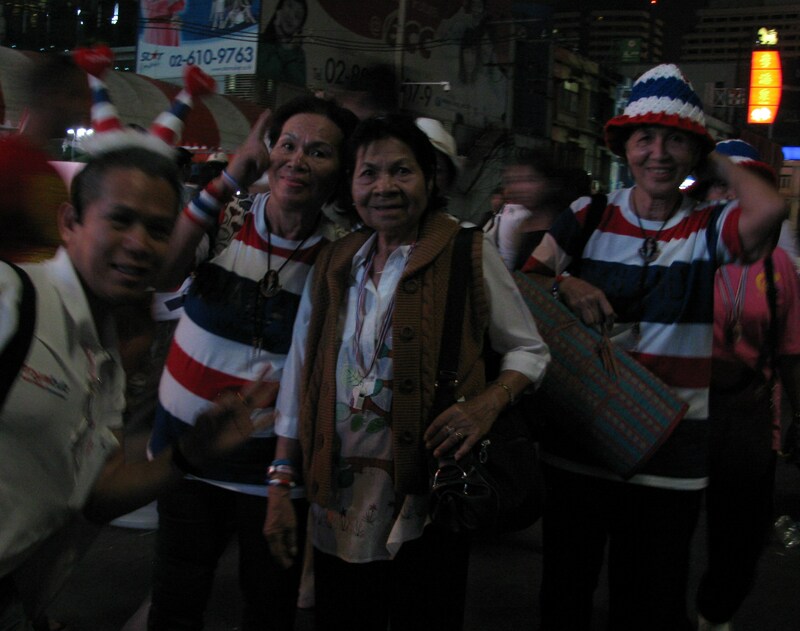 Support such as grants, national marketing and sales networks, Royal or government patronage or access to a domestic middle and upper class market. 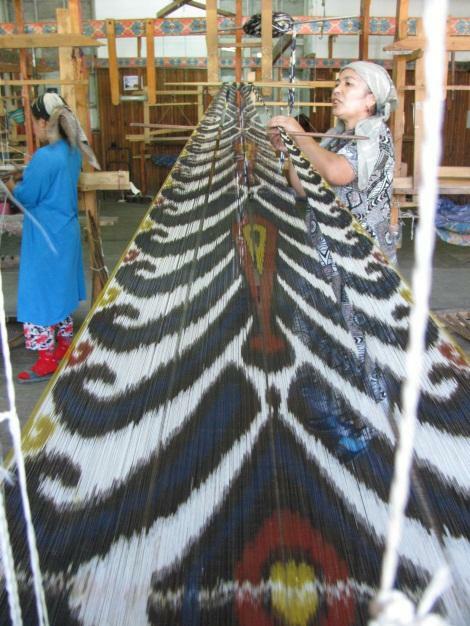 In Malaysia and Indonesia, handmade batik is time consuming and expensive to produce but it is supported by the well-off middle classes, who still buy it and wear it. 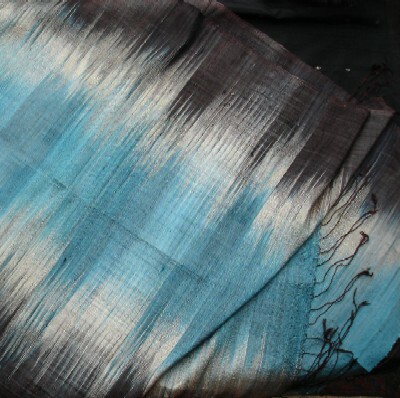 In Thailand, ikat weavers, indigo dyers, and numerous other handicraft workers are supported by foundations set up by the Queen of Thailand and promoted in outlets throughout the country. 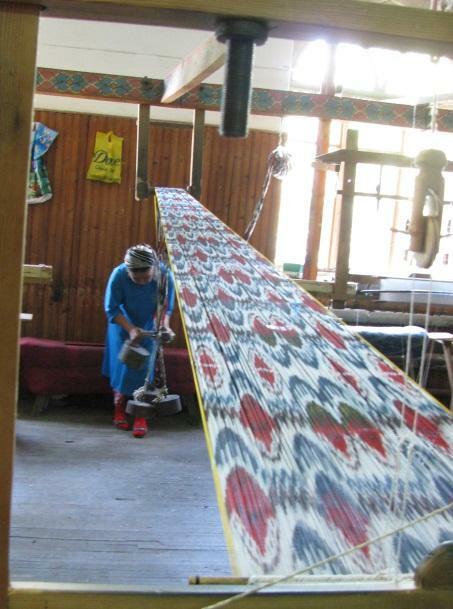 In Turkey, naturally dyed hand -made carpets are making a comeback because of good demand for them from Europe. 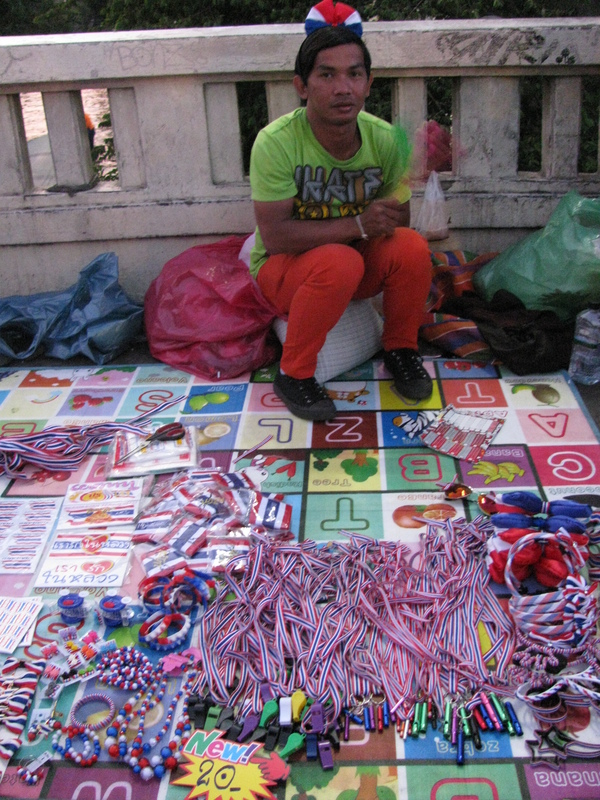 In Bali top quality wood carvings, textiles and other crafts can be sold to the many foreign and domestic tourists. At the moment Uzbekistan has none of these so all the small craft enterprises are struggling. President Karimov is only interested in selling the country’s industrial and agricultural assets (particularly cotton) and it has virtually no middle class market for high quality products. 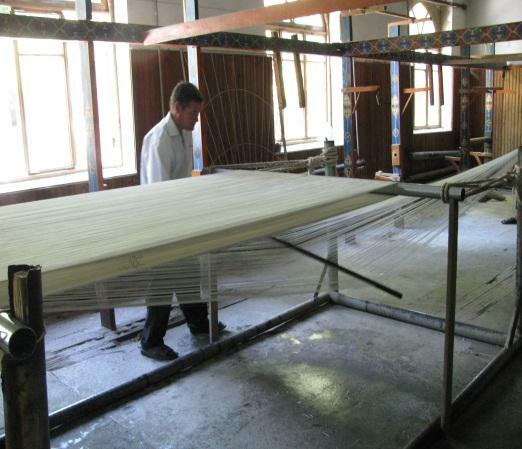 Perhaps foreign tourists could play a part but at the moment Uzbekistan is not top of everybody’s list and the Yodgorlik needs to sell itself with an informative tour of the workshops and a good shop. In other words, getting rid of Old Grumpy would be a start. 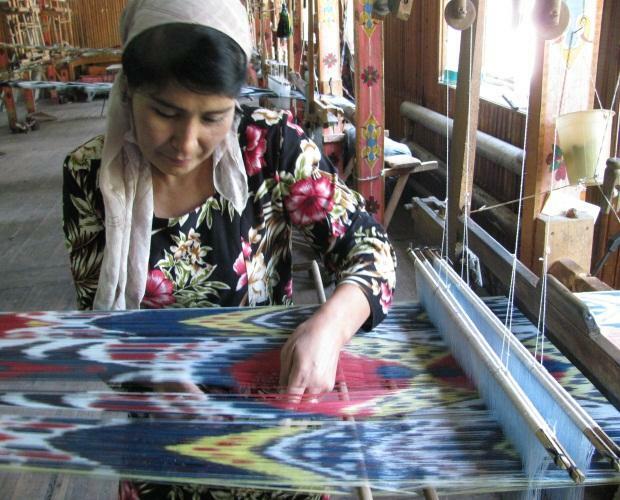 But it’s sad to say that without some help I don’t think this wonderful project will be able to sustain itself, and true Uzbek warp ikat will no longer be made in the Fergana Valley.